Unlike a time when visual information was identified, captured and distributed almost exclusively by professionals, the increasing use of content produced by eyewitnesses is unveiling the potential and peril of such footage. Questions about who is capturing images, who is featured in said images and whether or not consent is involved are only some of the things that Madeleine Bair, program manager of WITNESS Media Lab, said journalists should be considering. 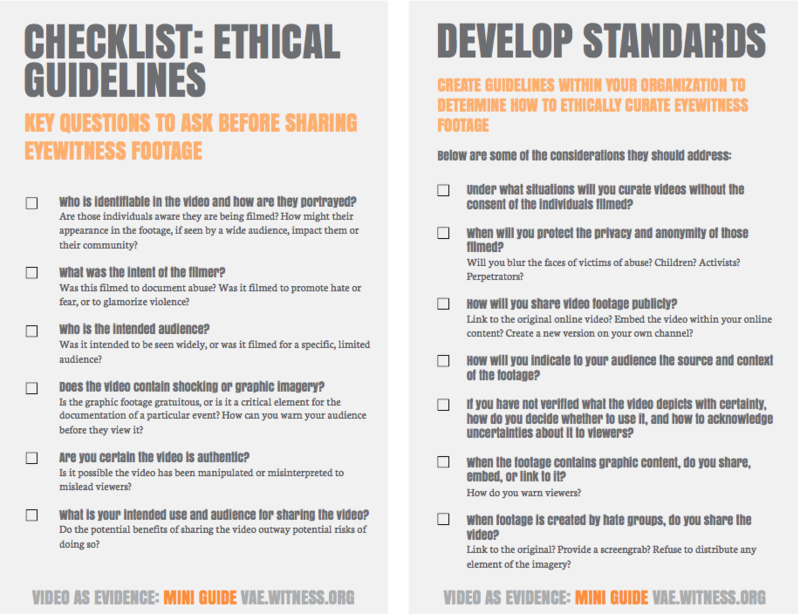 In an effort to beginning addressing these questions, WITNESS, a Brooklyn-based international organization that trains and supports people in human rights video documentation, recently announced its Ethical Guidelines in Using Eyewitness Footage for Human Rights. Witness defines eyewitness footage as video taken at the scene of an incident by private people, including bystanders and people involved in the situation.In addition to tangible checklists, a variety of examples and situational commentary, the release of the WITNESS guidelines underscores the rising popularity and importance of eyewitness content. Claire Wardle, co-founder of Eyewitness Media Hub, said not only does eyewitness content give voice to those who produce it, but it also has become an expectation by those who consume it. The organization is a nonprofit dedicated to exploring the ethical, legal and logistical use of user content in news. “Up until relatively recently, news arrived and then you’d have the aftermath of an event. Now because almost everyone has a very high resolution camera in their pocket in the form of a phone, we’re now getting images of the actual event there and then,” she said. This perceived demand has led to increased use of eyewitness media, though a 2014 study from Eyewitness Media Hub suggests that increased awareness about the legal and ethical dimensions of using such content has not yet been realized. The study found that photographs and videos featured in online newspaper articles were often presented inaccurately or used without permission. And even if newsrooms may be making strides in seeking permission to republish, Wardle said, journalists tend to altogether ignore the consent of the individuals featured in the videos. Wardle argues that despite the competitive environment of the 24-hour news cycle, obtaining consent of individuals in footage – even those shot by citizen journalists – is important. Wardle also said that just because information is posted publicly online or through social media, journalists should not assume the right to share the information more widely. Besides taking points from ethical guidelines like those released by WITNESS, Wardle said that honoring the rights of individuals featured in eyewitness footage will really take off with a change in journalist mindsets. Bair said she hopes that the WITNESS guidelines will be just one part of a larger conversation that will begin to address these ethical issues of using and sharing eyewitness content. For Wardle, navigating the ethics of eyewitness journalism is simply an extension of the golden rule. Checklist developed by WITNESS for eye witness footage of events. Used with permission. The guidelines are downloadable as a PDF from WITNESS.